After being sent back from the light, Alona Dare–former homecoming queen, current Queen of the Dead–finds herself doing something she never expected: working. Instead of spending days perfecting her tan by the pool (her typical summer routine when she was, you know, alive), Alona must now cater to the needs of other lost spirits. By her side for all of this, ugh, “helping of others” is Will Killian: social outcast, seer of the dead, and someone Alona cares about more than she’d like. Before Alona can make a final ruling on Will’s “friend” or “more” status, though, she discovers trouble at home. Her mom is tossing out Alona’s most valuable possessions, and her dad is expecting a new daughter with his wicked wife. Is it possible her family is already moving on? Hello?! She’s only been dead for two months! Thankfully, Alona knows just the guy who can put a stop to this mess. Unfortunately for Alona, Will has other stuff on his mind, and Mina, a young (and beautiful) seer, is at the top of the list. She’s the first ghost-talker Will’s ever met—aside from his father—and she may hold answers to Will’s troubled past. But can she be trusted? Alona immediately signs her name in the “clearly not” column. But Will is, ahem, willing to find out, even if it means leaving a hurt and angry Alona to her own devices, which is never a good idea. 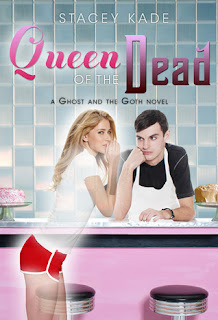 Queen of the Dead is book two in Stacey Kade’s The Ghost and The Goth series. Like in The Ghost and The Goth, it’s full of humor, real life issues, and dead people lol. Will is learning to deal with everything that has happened and the fact that his “girlfriend” Alona, is a cheerleader ghost who can be a bit self-centered at times. He still doesn’t quite understand why he can see and hear the dead, but he is dealing with it a lot better than before. Alona is also getting used to the fact that she is a ghost and the only time she can become solid is when she is around Will. They both decide to work together and figure everything out, but things change when Will meets Mina. Mina is exactly like Will, they both deal with ghost. Will is excited to finally meet someone else like him and he thinks that now he will finally have answers. Of course Alona hates Mina and feels there is something off about her. She tries to warn Will, but he shrugs it off as jealousy. Alona also turns to Will for help with her parents, but he is so lost in this new world he has just discovered that he barely pays attention to Alona, which then leads her to do something crazy and make things ten times worse for the both of them. Alona is such a funny and entertaining character. You can't help but love everything about her. She is the cheerleader in school you want to stay away from and getting on her bad side is a big NO! But down deep inside she is like any other teenage girl. And when Will and Alona are together, it's even more entertaining. She tries to be the strong “I don’t care” type and Will see’s right through her...literally. He has always cared for Alona, and that hasn't changed in book two. In Queen of The Dead both characters grow a little. I can easily see this series being a TV show. It’s such an entertaining, funny and fast pace read. I think children of all ages can pick up the first book and Queen of The Dead, and enjoy it. It has the right amount of everything in it. I hope I don’t have to wait long for the third book in the series. Kaitlyn, it really would be. I love it!